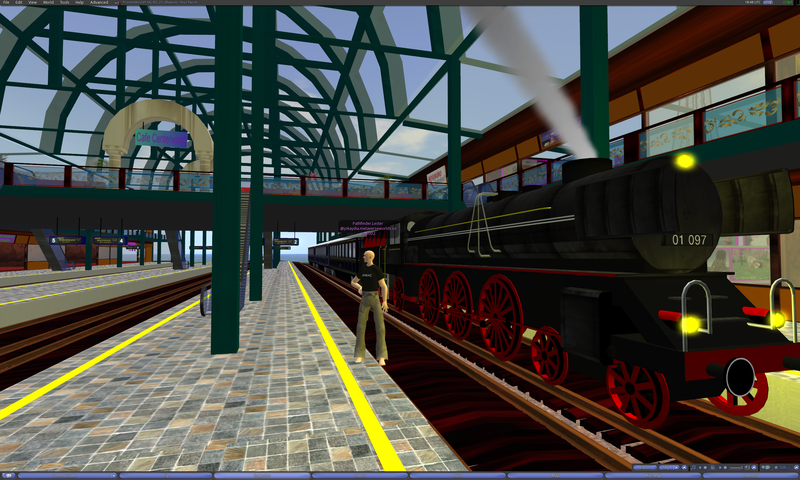 Last week our Hypergrid Adventurers Club took a tour of Metropolis and explored the large train station at the Metropolis arrival point region of *CenterWorld*. During this tour I met Lena Vanilli, the owner and manager of Metropolis. Lena graciously informed me that I could set up a presence for our Club in one of the vacant storefronts inside the train station. So I’ve done just that! Inside this new Outpost, curious visitors can partake of some of the exotic freebies I have found on our Hypergrid adventures to far off lands. 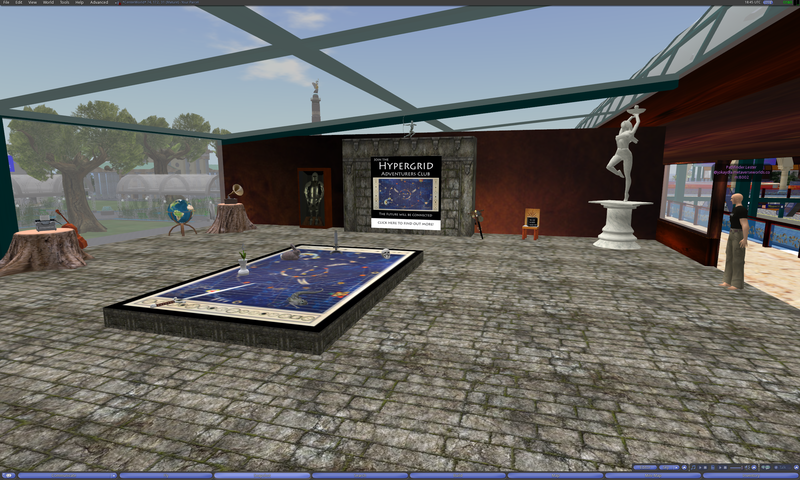 There’s also a kiosk with more information about the Hypergrid Adventurers Club. And I created a German-language sign with a notecard (in German) on how to make a Hypergrid journey from Metropolis to Pathlandia in case any of the citizens of Metropolis wish to attend our weekly meetings. Over time I’ll see if I can set up more Outposts like this on other grids. I think it could be a nice way to raise awareness of our Club and to share interesting freebies with folks. If you wish to visit our new Outpost on Metropolis, just follow the instructions on how to reach Metropolis in our previous tour. A view from inside the train station on the region *CenterWorld*. The view from outside of our new Outpost. External view of our Outpost. Inside the Outpost. The Map and assorted freebies. Here’s the German-language sign that gives out a notecard to help folks from Metropolis find our Club’s Home Base on Pathlandia. Dies ist ein Außenposten des HyperGrid Abenteurer Clubs. Wir haben viele kostenlose Artikel auf unseren Erkundungen im HyperGrid gesammelt. Bitte nehmen Sie Kopien von allem, was Sie möchten. Da JokaydiaGRID im HyperGrid sehr weit weg von Metropolis ist, müssen Sie zwei HyperGrid Sprünge machen. 1) Öffnen Sie Ihre Weltkarte. 2) In dem Textfeld neben der Schaltfläche “Suchen” geben Sie die HyperGrid Adresse: hypergrid.reactiongrid.com:9009 ein. 3) Klicken Sie auf die Schaltfläche “Suchen” und warten Sie, bis die Karte sich zum Ziel bewegt. 4) Klicken Sie auf die Schaltfläche Teleport. Sie befinden sich nun auf der Region “HG Gateway 1″ im ReactionGrid. Dies ist eine Region in der Mitte des HyperGrid. 2) In dem Textfeld neben der Schaltfläche “Suchen”, geben Sie die HyperGrid Adresse: 66.240.233.81:9001:pathlandia ein. Sie sind jetzt auf der Region “Pathlandia” im JokaydiaGRID angelangt. This entry was posted in Announcements, Avatars, Education, Hypergrid Adventurers Club, OpenSim, Virtual Worlds and tagged avatars, german, HyperGrid, Hypergrid Adventurers Club, jokaydiagrid, metropolis, metropolis metaversum, online communities, OpenSim, ReactionGrid, virtual worlds by John "Pathfinder" Lester. Bookmark the permalink. Sie befinden sich nun auf der Region “HG-Gateway 1″ im ReactionGrid. Dies ist eine Region in der Mitte des HyperGrid. Wow, thank you for that much better version. I will replace the notecard (and my text in my blog post) right away. I appreciate the help! I also gave you credit now for the translation. 😉 Thanks again, my friend. 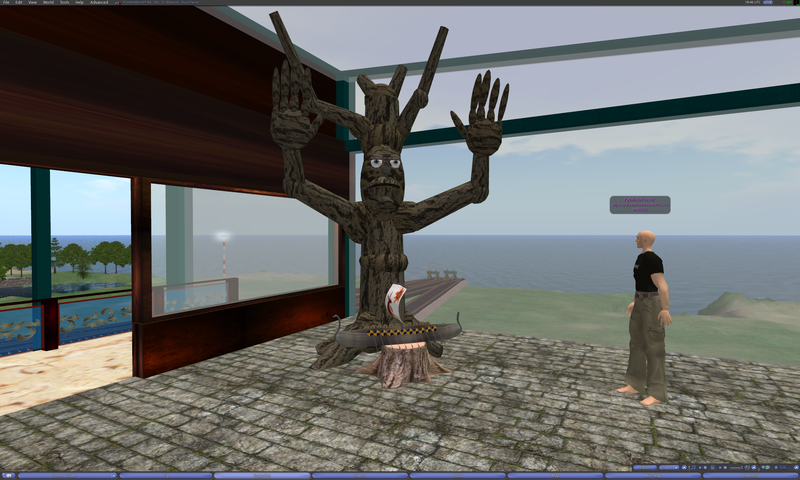 Ending the land duoiscnt for nonprofits is consistent with LL’s pattern of incubating desirable elements in SL and then tossing them up to fly unaided. Unfortunately it is also consistent with LL’s pattern of irregular, aimless support and bad timing that fail to maximize the benefits of those communities or grow them fully-fledged before kicking them out of the nest.LL has done this with SL schools, with the Mentors, with the Burning Life artistic community, with RL educators, and now with nonprofit and educational landowners.